The Harmonized Commodity Description and Coding System generally refers to “Harmonized System of Nomenclature” or simply “HSN”. It is a multipurpose international product nomenclature developed by the World Customs Organization (WCO). It first came into effect in 1988. It has about 5,000 commodity groups, each identified by a six-digit code, arranged in a legal and logical structure. It is supported by well-defined rules to achieve uniform classification. The main purpose of HSN is to classify goods from all over the World in a systematic and logical manner. This brings in a uniform classification of goods and facilitates international trade. Over 98% of the merchandise in international trade is classified in terms of the HSN. Harmonized System of Nomenclature number for each commodity is accepted by most of the countries. The HSN number remains same for almost all goods. However, HSN number used in some of the countries varies little, based on the nature of goods classified. India is a member of World Customs Organization(WCO) since 1971. It was originally using 6-digit HSN codes to classify commodities for Customs and Central Excise. Later Customs and Central Excise added two more digits to make the codes more precise, resulting in an 8 digit classification. The HSN structure contains 21 sections, with 99 Chapters, about 1,244 headings, and 5,224 subheadings. Each Section is divided into Chapters. Each Chapter is divided into Headings. Each Heading is divided into Sub Headings. Section and Chapter titles describe broad categories of goods, while headings and subheadings describe products in detail. First two digits (62) represent the chapter number for Articles of apparel and clothing accessories, not knitted or crocheted. Next two digits (13) represent the heading number for handkerchiefs. Finally, last two digits (90) is the product code for handkerchiefs made of other textile materials. India has 2 more digits for a deeper classification. If the handkerchiefs are made from a man-made fibre, then the HSN code is 62.13.90.10. If the handkerchiefs are made from silk or waste from silk., then the HSN code is 62.13.90.90. Like goods, services are also classified uniformly for recognition, measurement and taxation. Codes for services are called Services Accounting Code or SAC. The last two digits (13) represent detailed nature of service, i.e., legal documentation for patents etc. These HSN codes must be declared in every tax invoice issued by the taxpayer under GST. The turnover for previous year will be considered as a basis to find out number of HSN digits to be used. All 8 digits of HSN code is mandatory in case of export and imports under the GST. 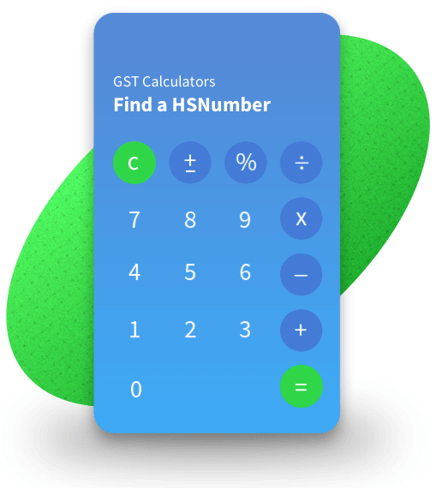 Why is HSN important under GST? The purpose of HSN codes is to make GST systematic and globally accepted. HSN codes will remove the need to upload the detailed description of the goods. This will save time and make filing easier since GST returns are automated. A dealer or a service provider must provide HSN/SAC wise summary of sales in his GSTR-1 if his turnover falls in above slabs. How can I find my product in HSN list and its relevant HSN Code? Please visit our handy HSN Calculator to find out both HSN codes of goods & SAC codes of services. UQC stands for Unique Quantity Code. In simple terms, it is a unit of measurement such as 1 kilogramme of wheat, 1 litre of oil etc. Refer our article on UQC for more information. To minimize errors while filing GST returns, it’s important to know the right HSN code for your product. Use ClearTax HSN Calculator to find out the HSN code for your product. Our ClearTax GST Software has all the HSN codes inbuilt. You need to select the items you sell only once in the Item Master. Once you are done, your HSN code will be automatically populated in all your invoices and returns. We couldn't find any HSN Code for your search. Try changing the keywords. For e.g. if you are looking for clothes try synonyms like garments, textile, handloom, etc. We couldn't find any SAC Code for your search. Try changing the keywords.